Here are her questions and my answers. I'm even going to keep to her sentence limits. (Imagine that!) How would you answer these? Teaching, blogging, wiki-ing and learning from others online. Any time I learn something new. I miss managing people and a budget. 1) A better mother and wife. 2) A more inspirational teacher of my students and the world. Dale Carnegie - I would like to see him in action. 4) A. What three words might your best friends or family use to describe you? What one thing (that is not X rated) makes you the happiest? Seeing my children succeed and overcome the struggles of their lives. Why am I doing my current profession? Look yourself up in Wikipedia: You might be a beauty queen! I know there is debate about what type of people should be included in Wikipedia. Imagine my suprise when I looked my name up in Wikipedia on a whim and found a budding teen who will be competing in the Teen USA competition 2007 listed on the page. I went on the talk page and expressed my concern that I don't think that pageant winners would qualify for wikipedia status. Or do they?
" ...add to the collection of pages relating to the Miss USA and Miss Teen USA national and state pageants - and the titleholders. If you know anything about a past or present Miss USA delegate please create an article for them! The quickest way to the links is to go to the state pageant page (Category:Miss USA state pageants) and click on their name from there." "Wikipedia is an encyclopedia incorporating elements of general encyclopedias, specialized encyclopedias, and almanacs. All articles must follow our no original research policy and strive for accuracy; Wikipedia is not the place to insert personal opinions, experiences, or arguments. Furthermore, Wikipedia is not an indiscriminate collection of information. Wikipedia is not a trivia collection, a soapbox, a vanity publisher, an experiment in anarchy or democracy, or a web directory. Nor is Wikipedia a dictionary, a newspaper, or a collection of source documents; these kinds of content should be contributed to the sister projects, Wiktionary, Wikinews, and Wikisource, respectively." I like Wikipedia and will use their methods to promote its effectual use, however, when there are users dedicated to the propogation of trivia in Wikipedia, I think its editors should step in. They have created several other places for such news including: Wiktionary, Wikinews, and Wikisource. Looking on the history page, I see some great editors including Jo McCleay, Dave Cormier, and Bud the Teacher. I guess the one thing that has struck me -- here we are creating incredible resources and wikis of our own and yet ignoring the most popular wiki with the widest reach available, Wikipedia. I talked to an orthopaedic surgeon the other day who says he consults wikipedia on an ongoing basis as his first stop. He commented that several errors and omissions really bothered him. I then told him that I believe if he is going to use Wikipedia, that if he is qualified (as he is) he has a professional responsibility to edit wikipedia. What do you think? I challenge each of you to join in and work to improve wikipedia -- AND DON'T go starting a contest of notable edubloggers -- don't add your own name to the list. I would actually stay away from that. Just remember, this is the picture of edublogs that is shown to the world. Are you happy with it? Does it need more information? Hmmm. The bunny trails that we get on random searches! Stephen Downes has a great synopsis about "The List" that I blogged about last week. Christian Long demands that his link be removed ... Darren Kuropatwa asks, Why would Jimmy do this?, John Pederson creates wiki out of the list and says, "fix it." Stephanie Sandifer raises the question of transparency and blogging ethics. Dean Shareski quotes some Seinfeld. Miguel Guhlin ponders the nature of publicity and thinks about truth, trust and transparency. ... So what, may I ask, is Jimmy Atkinson's misdeed? Nothing, really - no ads, no commercialism, no payment-based linking....Meanwhile, Bryan Alexander remains neutral and points to some who react more positively: Cool Cat Teacher, Jon Yang, Alan Levine, NYC Educator. Here is my comment about this nonevent that I think has become an event. I posted it on Stephen's Blog but wanted to share my thoughts here. Anything that brings attention to the edublogosphere whether or not I'm on the list is a good thing. Let's not give it more credence that it deserves, but yet it is a list. Honestly, I don't know how many readers they have, but they certainly GOT READ by all of the edublogs that they link to as most of us read our links in Technorati which perhaps was their purpose anyway. 1) Impuning the motives of a person you do not know is not right. 2) Let's keep the main thing the main thing. Our focus is to be on education. Bunny trails can get us off the main focus. As the "marketeers" begin to understand the power of the blogosphere, we will see more and more such things happen as people link to us in order to get us to review / respond/ advocate. Are we going to let them get us off track? My inbox fills with companies trying to get me to do just that. When people read your blog, you have responsibility. We've so we'd never heard of Jimmy? I say "Welcome." Perhaps his list wasn't perfect (I wasn't listed under a teacher blog and I'm the Cool Cat Teacher and several were left off) but you know what? When I pointed it out in my post, he corrected it rapidly. There is an old southern saying "Don't burn a bridge you might need to walk across later." With the explosive growth of the edublogosphere, newcomers arrive daily. As a person who has been blogging a little over a year, I remember those who helped me early on AND those who were particularly unkind to me, "a nobody." I appreciate those like Stephen Downes, David Warlick, Will Richardson, and others who welcome newcomers and report "the news" as they see it. I also appreciate that they were early encouragers of mine -- some of the lesser knowns of the blogosphere were not so kind because "who was I? -- a nobody." But in this day of explosive growth, everybody's got to start with a first post. Be kind, keep perspective, encourage newcomers, encourage responsible blogging, and focus on our common mission: better education in the classroom. And I'd like to add one cardinal rule for bloggers -- IF YOU HATE SOMETHING, DON'T LINK TO IT. Don't blog about it, don't link. Don't even mention it. For, I would say this thing would have died except for those who've been writing so profusely. And people love a good fuss, so everyone looked at it. And when you encourage what you consider bad behavior, guess what you get, more bad behavior. I have several people that disparage me on a pretty frequent basis -- my answer. Nothing. For in linking to them, I do them a favor and encourage others. Why would I do that? And because of this - they now have 61 links from 47 blogs in the educational community and have already broken the top 100,000 in Technorati (something that took me months to do.) So, perhaps I will be a little more wary of mentioning such lists in the future but I still stick behind my original post which was truly discussing the importance of pinging Technorati -- that is where newcomers like this database blog went for their information. Using Flickr to Teach Math! They were looking for Mathematics in places that people do not normally see it. They had to create "hotspots" (clickable squares) on their photo to show the mathematical concept identified. I think that this is an EXCELLENT way to make math seem real and relevant and really helps get students thinking. Or the pizza that teaches trig. IF you can access Flickr. It would be neat to have students BEGIN by commenting on Darren's projects and then create their own. Take his rubric and modify it for yourself. Why I think this is such a good project! Innovation - A teacher looking at a tool and saying -- How can I teach with that? Bring reality in - Students want meaning in the classroom. This takes math into their lives. Bring the classroom out - You can be sure that students will be sharing their knowledge with others and showing off their photo. Everytime they explain something, they are reinforcing their topic and learning. Share best practices - I believe that the professionally responsible innovator shares their learning and innovation. This is collapsing the sharing of innovational practices and educators who stay tapped in will reap great results. Giving students ownership - As I said, student feedback on rubrics is great! Creating a tagging standard. You simply must have a tagging standard (he gave them a course number) so the photo can be found! Incredible List from Miguel Guhlin! Speaking of great teachers, check out Miguel Guhlin's list of Web 2.0 apps for K-12 classrooms. I'll see you in a couple of days! By far, the best educational podcast that I listen to weekly is the John Merrow Education Podcast. This week he interviews the leading researcher on NCLB who can give you the positives and negatives of the act. If you want to talk in a meaningful way about NCLB and its impact - you can see that although NCLB seems to be helping the worst of the worst it may be pulling the higher level kids down. You need to listen to this podcast! "NCLB is a noble way to raise the floor for children." They also discuss how it has turned many schools into "test prep" centers rather than places for learning. As teachers and educators, we have the immeasurable opportunity to listen to such amazing interviews as they come out. Please listen. George Seimens is organizing an online Connectivism conference in February. I say the more quality online conferences with meaningful ways to interact, the better. But with one as high profile as this, they need some diversity in their line up both gender, race, country, and background. But, since they are still lining up some presenters, I'll reserve judgment till the final list is published. OK, here's my really goofy, Christmas Card to all of you, my readers, out there. You can follow the link to youtube and post a video response. I'll be watching them and may even put some of your Christmas greetings here for other educators to hear. Enjoy and forgive me for my imperfect singing, I had 5 minutes at break on the last day of school to record it so I had only one take! My student said it was OK so, here it is! Have a very Merry Christmas and happy New Year. Take time with the family! I wish I could talk to each one of your personally and wish you happy holidays -- but hey, I am! How to Create Your Circle of the Wise: How to pick the reads in your RSS. I believe the great men and women of history would look upon us with envy as we now have the greatest opportunity in human history to immerse ourselves in a circle of the wise. Using RSS and a free bloglines or netvibes account, you can now surround yourself with the leaders in your field and even become one yourself. So, how do you select your circle of the wise? How do you keep from being overwhelmed? How do you fit it into your already overfull day? How do I fit it in my day? Answer: One bite at a time." When I'm having a tough day, I always find encouragement in my circle of the wise. Life is tough and it is great to know that I'm not in it alone. How do you select your circle of the wise? It is very apparent that many will do anything in order to "make a buck." (a la Borat) You should be especially skeptical of just Googling and subscribing to those you find without knowing anything about them. When I began, I started with the one blogger I knew (David Warlick ) and then branched to those he knew (Will Richardson, Wes Fryer, Stephen Downes, Miguel Guhlin, Anne Davis), and then proceeded from there. The list on the sidebar of most blogs called the "blogroll" (see mine) is a great place to find your circle of the wise. However, don't let this preclude you from finding new people to read that you've never heard of (I started blogging last December and someone had to start reading my stuff!) If you know a wise person who blogs, read their blog. They may be the world's next discovery! Look for people who inspire you. Life is too tough to have real AND virtual people dragging you down. Never equate inspiration with fame (nor success for that matter.) I find inspiration in the lives of teachers who struggle with real problems but manage to teach and inspire anyway. They are my heroes. I look for people who understand the responsibility of blogging. They understand that "information doesn't travel in straight lines" and know that what they write today may be read by colleagues in five years. At that time, their colleagues will either view them as a pioneer or as a jerk. I prefer pioneers. I think most bloggers come in two flavors: egotists and conversationalists. The egotists just want to talk about themselves and somehow feel they have a "corner" on the market of knowledge. Conversationalists converse with those who post on their blogs and on the blogs of others than their own. Conversationalists are not stingy with their words but have joined the conversation about the topics they care about! I like to read people who are widely read and view new knowledge not as an opportunity to dig in and resist but to learn and grow. They are always teaching me something new that I didn't know and often pick up on the real stories that no one else is talking about. They are wise not because they know it all but because they know that they don't and have adopted a mindset of lifelong learning. I read people who strive for excellence no matter their field. I believe it is important to read the blogs of excellent people in fields other than your own. I get many ideas for my classroom from business leaders and can understand societal trends by listening in on political or news blogs. Excellence means that WHEN a person makes a mistake that they correct their mistake. It means that they sometimes change their minds with valid reasoning. These people have as a goal for their life to BE excellent. Not because anyone pays them but because it is what they believe in. I had to add this on because you can do a search of Google News and subscribe to that search via your RSS reader. If you're doing a thesis or have a particular area of research or interest, this is a must do for you. Anywhere you see the little "RSS button" you can subscribe. Just be careful with doing it to many times or you could be discouraged by the thousands of results that turn up! There is a reason that we parents care so much about the friends our children choose -- we know that they become like those in their circle. This is the time of year we like to make changes. I believe that every professional should undertake the building of their own "circle of the wise" and work to fit it in your day. Let me ask you this: if you were able to read the writings of Abraham Lincoln, or CS Lewis, or Ghandi, or Dale Carnegie on a daily basis, would you have done it? They are among you now. Find them and become transformed. The Online Education Database has perused through the Technorati Rankings to produce their categorized list of the top 100 educational blogs (in no specific order). I am happy to be included on the list, however, I believe I should be included under the Teaching category. I write for teachers as a classroom teacher. I also disagree with some of the other categories. It is nice to see the list, however, if the person authoring does not really follow the blogs, they may want to be careful categorizing blogs based on the recent posts. However, I guess it is ok to see how others view the blog. I'm also suprised that a blog like Doug Johnson's Blue Skunk Blog isn't included on the list. (I'm a big fan!) It looks like he may not be pinging technorati which could cause problems. For right or for wrong, Technorati is what people use to rank blogs and to be left out of Technorati will mean that sometimes you are left out of conversations that you should be included in. Help me pick out a Mac for my sister! Tomorrow my sister comes home from Disney and although she will return until early January, she needs me to help her pick out a Mac laptop tomorrow night! She is a graphic designer and an amazing person who, although she has several learning disabilities overcame the C's she was making in early high school and the "stupid" label of unknowing teachers and fellow students to graduate with highest honors from the Savannah College of Art and Design with both an undergraduate and a graduate degree. She is amazing and I admire her so much. She is returning home where she will teach part time for Savannah College of Art and Design as an adjunct online professor and will freelance. She does everything from Photoshop to Flash to Dreamweaver and more. She'll need to use her computer wirelessly as well as hooked to a high speed cable modem in our mostly PC based hometown. Help me! I don't even know where to start. You can weigh in by posting your comment here! (Others can learn from you too.) Over the summer, I asked you and you helped me create my dream lab and helped others too. So, if you love Macs, now is your time to speak up! I have been "tagged" by my friend Karyn Romeis in England and Doug Belshaw to share five things that you may not know about me. That's pretty easy as I'm a somewhat eclectic mix of energy, interest, passion, and fascination about almost everything, but here goes. Warning: If you don't want to know who I am, don't read any further. I get very personal about my beliefs and what makes me me. I usually blog about teaching and professional development topics, but this is a personal post. You've been warned. 1 - I am a farm girl. "You can take the girl out of the country but never get the country out of the girl." I grew up the oldest of 3 daughters to a very successful farmer. My dad is the former president of the American Soybean Association which is one of the largest farmer's organizations in the world. (There is a lot of video of him in the flat classroom project.) Accordingly, he has traveled the world and although he spent time divided between the fields of south Georgia and testifying in Congress on agricultural policy, he always made time for me and I spent just about every Saturday working on the farm with him. I remember one time we were struggling to lift a huge battery to an irrigation system to "jump it off" and I said, "Dad, its too heavy for me, I'm just a girl." He then told me to never say such a thing again and that I could do anything I set my mind to. He told me he would rather have us three girls and that we were just as good as any sons he could have ever had. My dad threw the football with me, we played basketball in bare feet and tennis until it was way past dark. I lived most of my childhood either outside or in front of the gadgetry that Dad would bring home. When Lotus 123 began their programming, they called Dad because he had done some amazing things on his TRS-80 with spreadsheets and graphing that made Popular Mechanics. When we got the TRS-80 in the 70's and I was not yet 10, I asked him to "teach" me the computer. He threw the book at me and said I was smart enough to "teach" myself. I've been doing it ever since. Our family drives consisted of listening to Dad tell stories of great men in history and I think I know almost every great (and funny) story about Winston Churchill and Lady Astor. (His nemesis!) I learned that great men and women go through many tough times and I saw my family go through them. 2 - I am a woman of faith. Growing up on the farm, I saw hard times when the weather wouldn't cooperate. I remember one time specifically when we DID NOT need any more rain -- we had turned the peanuts up and they needed to dry out. Rain would doom the crop. We prayed for NO rain and heard the rain was coming on the weather radio. We took our evening drive and looked out over the field. I literally saw the solid wall of rain part and go to the left and right of Dad's field. Life is tough and bad stuff happens to good people. Good farmers would lose everything and bad farmers would prosper. Justice will happen in heaven, that is why it is called heaven. Earth is chock full of tragedy and I'm thankful to have peace amidst the chaos of life. God is not a heavenly Santa Clause sitting there to answer our wish list. He has been to hell and back and has always helped me in my struggles as well. God is not real because it is convenient or because I was raised that way or because as many of the pseudo-intelligentsia say - I need a crutch. God is real because He's real. I have known and experienced Him all of my life and to separate me from Him would be for me to cave in and shrivel up and die. He is my best friend and although I often "mess up" He is the greatest person I've ever known. My number one goal in life is to seek out what He would have me do. This is very personal because most people do not understand and I am of the belief that my job is to love others and be kind to them. I leave the judging to the Lord, that is His job, not mine. I have throughout my life worked with and loved all types of people. I believe that is what I am to do. I usually only get this "preachy" on my devotional blog, but Karyn asked, and this is me. I cannot separate this from who I am. My definition of a good day is one where I get up early, read my Bible, spend time on my knees, exercise, cook a good breakfast for the kids, and get myself dressed up nicely to face the day. And a day that starts right usually ends right. Life is full of stress and it is nice to know that I have an advocate that can handle my worries. I think this may be perhaps why I'm 37 and don't have any grey hair (yet). I LOVE to cook, to read and to sew. I love action movies (the more explosions and special effects, the better). I collect movies of all kinds. I love to see live plays (particularly on Broadway, but alas it has been many years since I've done that --I'm on a teacher salary now). I love the outdoors and have learned about photography in the past year. I am addicted to technology and learning new things about it. My children are my hobby as is my husband. I always tell my husband that I'm the luckiest woman in the world because I get to be married to my boyfriend. That is how I view him and I view my children as on loan from their lives. When they are 18 -- gone. I want to love and savor every minute. I collect motivational sayings and books and could never have enough bookcases. I read with highlighter or pen in hand and treasure and love every book I own. I love to raft, hike, fish, ride ATV's through the country, and pick flowers. About the only thing I don't like to do is clean, but I find ways to motivate myself there too. 4- I live in a small town but am not defined by it. Living in a small town has its benefits: you know people and your kids cannot really get away with anything. (Our school has mandatory drug testing so that helps too!) When people pass away, the town mourns and cares for you. When you have a tough time, people are there to help you. (When my father in law passed away, a friend mowed our grass -- people brought food and we got so many letters.) That is the way small towns are. And yet, small towns can be so limiting if you let them. My family raised me and saved their hard earned money so that I could travel and get outside of this small town. They told me that there were bigger places than Camilla and although I lived here that my mind must be global. If you read my blog, you know I had a tough time in school with my classmates. In fact, my classmates pretty much never elected me to a single office and I lost about 12 elections before I began winning in 9th grade (when the whole school voted.) My classmates called me "dumb" and "no common sense" and "ugly" and "stupid" and so many other things I don't care to repeat. However, because of my family and faith, the good Lord has always chosen to bless me wherever He has put me to serve. (Now in teaching.) I have had to forgive because I now work alongside many of those who so wounded me as a child. I love this small town but I also know that it is a microcosm of the world at large with the same jealousies, bad habits, and unkindnesses that happen in the larger world. We miss that large circle of friends we had in Atlanta and yet the benefits of such a small town are immense. I have a 5 minute commute to the grocery store, church, or the school and am 10 minutes from my parent's house. I am close to my family and therefore I am strong in their presence. My sisters and mother are powerhouses and pull me out of the slump when those who do not have a global perspective and think this town "is all there is" try to get me down -- they get me back up. I am truly best friends with my husband, mother, and sisters. I am very close to my children. I adore them. I need them. So many people want to run me ragged...they love me without expecting anything in return. My roots run deep. I do love my hometown. I love my family. I love the country. My cure for my troubles is to go outside and play in the dirt. (literally) My husband and I are working and saving to build on the farm by my parents and I am praying for that day. Meanwhile, I live in the house where my dad grew up and enjoy the big back yard with three dogs and three cats! Life is good here but I keep it in perspective -- this is a small town. I must keep a big mind and not let myself be limited by the size of my town. I love to act and received drama and extemporaneous speaking awards in high school. I sing in church once a month and have begun making video tracks to go along with my music. When my hometown of Camilla was hit by three tornadoes on Valentine's Day several years a go, my husband and I were the head of the "volunteer command center." I wrote a database in a day to track and manage the more than 10,000 volunteers that came out a few days after the tornado and I managed the website. My husband managed the "work in the field." We were recognized by the Rotary Club and the National Volunteer Organizations Active in Disasters and spoke at their national conference. It was truly one of the most difficult but rewarding things we've ever done and it truly happened because the people here asked us to do it. (We worked solid for 14 hours + a day for three weeks and my husband's office gave him time off.) People from other places could not believe how fast our town recovered with it taking about half of the time of most towns. Kip and I were just part of a huge effort of local citizens but still recall this work with pride. I have written and published poetry. I was the only undergraduate teaching assistant for Dr. Phil Adler at Georgia Tech who now has the faculty wing named after him. He is amazing and I'm proud of this. I was a research assistant for Dr. Danny Boston who did some pioneering research about the underclass. He contributed to many of my opinions. I love to make jelly and homemade sourdough bread and cinnamon rolls. I have a book half written that I am working on this Christmas break. I have been journaling since I could write. My brother in law and sister are one of the largest alligator farming operations in the world and sells to Gucci and other Italian designers. Everybody who comes to see the farm wants to see Mark's gators. In fact, how about this -- if you read this post, consider yourself tagged! What are five things about yourself that others may not know? I'd like to get to know you better. Just link back to this post and I'll take a read! As my five year old napped, I took a moment to check my e-mail to find that the flat classroom wiki has received the 2006 edublog award for Best Wiki! I appreciate your votes and nomination and all that my co-wiki organizer in Bangladesh, Julie Lindsey has done. When I rode my favorite "slow ride" at Disney yesterday, Peter Pan, I literally relished the music and feeling. The entire ride is set to the song is entitled "You can Fly." Once you embark, you follow Peter Pan leading his new friends from their tiny nursery to fly over the rooftops of London where the cars look like tiny phosphorescent ants on the noodle-sized streets below. Then, Peter leads them through adventure, danger, and finally to a place where the good guy gets the girl and the bad guy stands spread eagle holding open the jaws of the crocodile while yelling "Smee, help me!" It is the stuff a little (or big) girl's dreams are made of. It is my favorite ride because ultimately I'm one of those semi-naive people who truly believes that if we tune out the naysayers and sarcastic cold water committees that we can truly accomplish things that are seemingly impossible. I mean, the bumblebee isn't supposed to be able to fly, for goodness sakes, but nobody told him and nobody told me. I adore great men and women such as Winston Churchill, Abe Lincoln, Dale Carnegie, and Helen Keller because they weren't supposed to be able to fly either. They lived through the tough times and didn't listen to critics but overcame and overcame and when they couldn't hold out any more, they got up again and overcame some more! I've often wondered how amazing it would be if Dale Carnegie had been a blogger and I could have read his work one day at a time as it emerged. I want to be that inspirational. I want to be better and more. I want to fly! And I want to convince the kids I work with that they can too. I've had enough of those critics who want to deflate the tires of my airplane and give me all the reasons I can't do something. I hope you'll choose to ignore them too. For I believe that within each of us are the seeds of greatness. And it is the stories of overcomers that are truly the great ones -- (not the stories of silverspoon babies who were successful via inheritance). It is the tough real life stories that they usually make movies about. (Rudy, Pursuit of Happyness (yes, I spelled it correctly), We Are Marshall, Flyboys, Chariots of Fire... and on and on). Every time I have a problem as I pray about it on my knees, I envision the amazing providence that will be evident when God blesses me and helps me work through and past that problem. God has truly blessed me! I shall not be defined by others' opinions! Rather, what do I do to make a difference in the lives of other people? What have I done to encourage them to be more and tune out the naysayers? What have I done to share what I've learned? What have I done to give others the credit they deserve? What have I done to help people who are having a rough time? What have I done to help lift the underdog out of the mud, brush them off, and give them hope? If I sound like I want to be superwoman, that is not me at all. In fact, this life isn't about me. Any time I feel indispensable, I put my finger in a glass of water and pull I out and remember that the cemetery is full of indispensable people who left just as much a mark on the world as the finger left in the water. But the only thing I shall leave behind is the engravings on the heart of others. That is a legacy. That is where I want to spend my time and that time is short! So, as I consider the many blessings I have -- my God, my family, my students, my school -- I am now adding another blessing to my list -- the edublogging community which is full of truly great people who rise above and never let others tell them that they can't fly. You amazing edubloggers that I read and that comment here do fly. You do it every day. You overcome people who misunderstand, misrepresent, and miscommunicate with you. You overcome people who often treat you like the machines you work so closely with and do not understand your feelings and that you need to be told "thank you" every so often. You overcome because you stick it out and work with children who rarely say thank you but demand all of the stores of energy we can muster. You are my inspiration and I am honored to now call myself one of you! Every time I read a story about how you've overcome, I know I can do it too! We have a really cool, cool guest tonight on WOW2 -- LESLIE FISHER (of www.lesliefisher.com) She will certainly be a fun chat and she is a gadget guru -- so come prepared to get some great ideas for last minute "tech" stocking stuffers!! 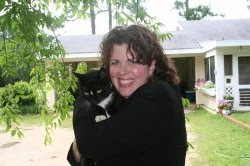 "I have known of Leslie Fisher now for about 7 years -- she used to a seminar leader with Classroom Connect Conferences and I can tell you that if you didn't get to her class early, you either sat on the floor or didn't get to attend. She is a popular and FUN speaker." We will NOT be hosting a live chat NEXT week. However, you are welcome to come to listen to the stream or download the podcast from our website. See you again in 2007, Tuesday Night, January 2nd. 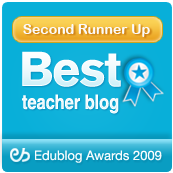 I'm so excited to be able to add the new badge to the left for the edublog nominations. It is truly an honor to be nominated. You have until Saturday night at 12 GMT to vote. There are many great people who have been nominated, so go vote for your favorite. It is the votes of many who know that will give these awards legitimacy. Sunday there is a large awards ceremony planned and you can attend. Cool Cat Teacher - http://coolcatteacher.blogspot.com - Read about the finalists and vote here. Read about the finalists and vote here. The parent of one of my students today said as school was getting out, "I'm go glad to see the students so exited about something at school. It is truly a great project." I shot a 30 minute video at our reward "field trip" to the local coffee shop. When I get it uploaded, you will be impressed at what these students have learned. I am proud of them and again grateful for my collaborator in this project, Julie Lindsey in Bangladesh. And remember the award winners are determined by your votes. Is having "another online life" good or bad? This really strikes a nerve with me because if it works soon everybody will be putting themselves in ads saying things for money that they don’t believe. But that’s what ads are after all. Does this bother you? Is this what ads are for? Do all of our students know that this is what ads are for? What if we asked students to create TV, radio, or print ads for a product, and then ask the class (or other classes on line) to rate the ads based on their likelihood that they would buy the product. Might they then have a better understand of what ads are for? I think that if a person truly believes in Mega Globe,then fine, go for it. However, I believe the world is getting bigger and smaller at the same time. Personal integrity has decreased over the years because of masses, now because of the individual accountability of blogging, I think that personal beliefs and character are now front and center. I’ve struggled with people telling me to put Google Adsense on my blog and perhaps there is nothing inherently wrong with it, but I cannot control what I endorse. Because of this, I cannot at this time put it on my website. In the small town I am from, your word means everything. To be an ethical, meaningful participant, our word must mean something. We must learn the web is real life and not a second one and that myspace is not truly “my space” it is the world’s space! We must teach it and must practice it! I think we have problems now because many are living their lives with no accountability. I have "accountability" people who know me and see me for all of my blogs. It makes me think twice. It helps me remember that THIS IS REAL and not just some alter ego pseudo persona of me. With an iTalk phone imagine this. Take photos to post to their blog. Record teacher lectures and listen to them later. Record their thoughts before starting a writing project. Listen to podcasts they've subscribed to over iTunes. Download public domain books to listen to. Watch videos from their classmates about educational topics. E-mail reminders from their teacher. Text reminders of the work for the day. Some of you would say, "Awww, that's supposed to be a fun gadget and you're using it for work." Yes, it is a fun gadget and if you look at the specifications, it has more computing power than the TRS-80 I learned Basic on in the 70's. Stop Fighting it, start using it. And if you don't believe me, read Time Magazine this week! Now, the brightest student of Socrates could flunk out because they were illiterate! Today, the students who read and write effectively (like me) are rewarded while those who absorb information via video and podcast and have effective oral expression skills may not as rewarded. Isn't this the whole point of differentiated instruction (and assessment.?) Perhaps teachers have such a hard time with differentiated instruction because we are too homogeneous in our own learning styles? In twenty years, perhaps the whole learning landscape will change. I hope not! I hope that in the next twenty years by the time my daughter is teaching, that we can begin to focus on what students honestly learn, no matter the conduit/delivery mechanism of the day. Learning is a process that happens within a student, not to a student. This is not a clay pot we are shaping and firing into place, it is a process and one that must continue for a lifetime. It is time to bring all of our students into the classroom and into a richer, more exciting learning environment. It is time for educators to wake up and have a morning cup of wake up to modern society-juice. I know its tough, but we do it because we want to be known as the generation of teachers that changed even when it was tough. It was tough for pioneers to go out West but they did because of their pioneering spirit and the hope of opportunity and profit. We must do the same. After losing many of their kind to Indians and wild animals, the pioneers began to travel in wagon trains. They learned of the power of encouragement on dark roads and safety in numbers. Yesterday, as we were chatting in the Wow2 edtechtalk, someone asked if it should be top-down or bottom-up for Web 2.0. I said it should be ME-out. The only person I can change is ME! I must reform. Web 2.0 is about social interactions and the way that web 2.0 spreads from one person to another is like the flu -- from one person to another. If you are a newcomer, great, learn and share! Don't learn and sit on it! And don't make excuses and say, "Well, that's fine for Vicki, everything is peachy for her." Well let me tell you its not! I am a real teacher and those who push the envelope are misunderstood and criticized by many who fear change. That is life and nothing is more real than a classroom! I have never had enough money (why do you think I like things to be free) and never had enough time (I fix 100 computers and teach 5 classes and am involved in lots of outside activities), and never had enough encouragement (I stick to my "circle" of trust and take the pundits' thoughts with a grain of salt.) I know these tools work because of the improvement in my classroom and student performance. It is anecdotal evidence, yes, but it is real. The energy and excitement in my classroom is alive! It is a great, albeit tiring, place to be! So, hitch up the wagons, let's go. A new day is ahead for education. And the students that prosper will be those who are getting the right kind of education now. The best educators will not be known by the test at the end of the year, but in twenty years when those who are successful call their names. Remember your noble calling, teacher! It is not an easy job, but it is the greatest job in which the very future of mankind resides. Just finished an amazing edtechtalk with David Warlick and Sheryl Nussbaum-Beach -- just amazing! It will be posted on the Wow2 podcast in the next several days. Then, I did it. I locked down the main topic pages on the Flat Classroom Wiki -- They've all done an amazing job -- but remember, these are real students and there is a full range of performance here. Here are the topics. 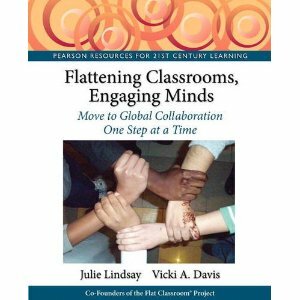 I've not had a lot of time to blog a lot about what is happening in flat classroom but I took a moment today to record my thoughts on how this project is going. This is also being sent through my podcast -- you can now subscribe through iTunes by searching for Cool Cat Teacher. I told the perfectionists that I'd spend as much time as they needed me to help them "perfect" their movies and wikis. But as with all projects, there is the full range of performance from A to C levels in the results. This is as one would expect. I've gotten permission to take the students on Thursday to the local coffee shop as a reward and we will watch the finished videos on the big screen there. We will record our conversations and I plan to share them with you. Final post in three part series. This one covers how to upload video to Google video, how to add your descriptions, and how to embed it in your wiki. I worked this morning until a little after 6 pm with my students. I feel like I'm taking final exams! They are learning and very proud of what they are doing. This is what teaching is all about. We have 5 of the 9 videos finished and several others close. Remember the edtechtalk tomorrow at 9 pm EST with David Warlick and Sheryl Nussbaum-Beach. Just go to edtechtalk.com and get into the chat room. Also, you may listen via a skypecast (Go to skypecasts.skype.com and search for Women of Web 2 -- you don't need to be a woman to listen!) or on Channel 1 at Worldbridges. The world has changed, but the American classroom, for the most part, hasn't. Now educators are starting to look at what must be done to make sure our kids make the grade in the new global economy. Well, goodness me, its about time that someone took notice of the fact that technology isn't a subject. This is a must read article for all educators who care, not just techies. It is in the December 16 version of Time. Be there, or catch the podcast in our archives at http://www.womenofweb2.com/node/12. In this time of hurry and sometimes fury, remember how important it is to finish well. This is the time of year that the weaker teachers prop up their feet and eat divinity but the excellent one's still have objectives. Although my eighth grade has turned in their portfolios, I am doing a fun project in movie maker so they can use it in their other classes next semester. I have a purpose for even the fun things. How about using Photostory to make movies of family pictures that can be burned to DVD for Christmas presents? (Have them bring the DVD's). They can learn a great program and have a gift for home! I think of the races I've seen where the runner in first place looked back (and then finished second.) We must look ahead. Have fun but always have a purpose. Never waste a moment. Use all of this precious time. Teaching is never about babysitting it is about making a life long difference. It is about pushing ourselves and our students to places that people think we cannot go. To think in ways that are beyond the average. To be excellent in all we do. Teaching is the most noble profession on earth. And as I celebrate this Christmas season according to my beliefs, my God sent his Son to this earth -- and he asked people to call Him ... teacher. I need no greater endorsement of my profession. Remember the Web 2 wonderland! And remember to take a picture of your class doing something web 2 and upload it to flickr for me -- tag it web2wonderland! Please! Using and citing video from Google Video in your Student Movies. Julie and I have been creating movies to teach our students about the various skills needed for our flat classroom project. (Which ends Tuesday.) These are quick videos so everything isn't perfect, but I discovered how to "rip" and use video from Google video in Windows Movie Maker files and created a tutorial for my students. I thought you'd like a copy. Also, I've got a video about how to cite video. If you take the time to watch, you will see that there are many issues with citing video, one of which is that MLA has yet to determine how exactly to cite the wealth of electronic resources out there. If you know how to cite video, please help me. My eighth grade class is going to be making a video out of a recording I am making of "Web 2 Wonderland." (A song that I've written.) We want your classroom to be included. This is a great way to teach tagging to your students and to share with the world what classrooms are doing with Web 2. We already have Craig in Greece showing how he is using cell phones to blog and Kinderkids podcasting about bears. We want to include your class! Make sure that you give a caption to identify your school and what Web 2 you are doing! Please spread the word. This is a great chance to show off how flickr works and teach the principle of tagging. It is also a great way to do some simple collaboration. I think this could be a very powerful tool to show educators the faces of these children using technology. Please be a part! Mr. Schneider from Seymore High School contacted me this week to let me know his students were making a "flat classroom video." They posted it to youtube and it is going to be very exciting for my students to view today during their Saturday work day! I've been up since 6 a.m. creating video to help the students with their Google video work. I'll share that after I post it up today. Julie's been working all day Saturday (while I was sleeping Friday night) with her students. We still have some students who have difficulty connecting (via Skype) but overall most groups are working together very nicely. The students are very excited about their edublog award nominations. It is really exciting and truly most of the amazing work on the wiki is theirs. After posting closes Tuesday, I'll give you the links to their projects. Thank you for nominating me: Cool Cat Teacher and Flat Classroom Wiki are on the Edublog Award 2006 "short list"
And then she let me know that my teacher blog, this Cool Cat Teacher blog has been nominated for the best Teacher Blog. (Voting ballots) (See all edublog nominations here.) It is now up to you to vote, and truly, every nominee is very deserving! You, my readers, have truly given me the best blog-birthday present I could ever receive! Because these nominations must come from fellow edubloggers over a somewhat labor-intensive e-mail nominations process, it really means a lot to me to be nominated. I blog in semi-isolation but now am surrounded by the most amazing network of incredibly professional and wise educators! It has truly been a great year for me both in the classroom and in my own learning! Some amazing people are listed in every category and again, I will be taking the time to go through, read, and vote. I hope you will too. All of the nominees in every category are truly deserving in my opinion and I'm just so happy to be included on the list. My students have stepped up their efforts even more (if that is possible) and have pleaded with me to open the lab tomorrow. We're going to be here at 9:30 a.m. and work until. Julie Lindsey's class is working on Saturday also. I'm being begged to let them come to class and for me to help and teach them. This is not out of procrastination, mind you, but rather a desire for excellence! I'm going to pick up pizza and they are going to keep working! The wiki project closes on Tuesday, December 12 at 12 midnight GMT.